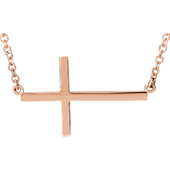 The 14k rose gold solid cross pendant for women from Apples of Gold Jewelry is uniquely made because it has depth and thickness to it, compared to the flat crosses on the market today, which are mass-produced. Each of our women's 14k rose gold crosses are individually made by expert jewelry craftsman, right here in the United States. The rose gold cross measures approx. 1" tall x just under 3/4" wide and 1.75mm thick (1 1/4" tall with hoop/bale) and weighs approx. 3.7 grams of 14k solid rose gold! Also available in 14k yellow or white gold (shown below) or pair it up with a matching men's rose gold cross, also shown below. "Cast me not away from thy presence; and take not thy holy spirit from me" (Psalm 51:11). 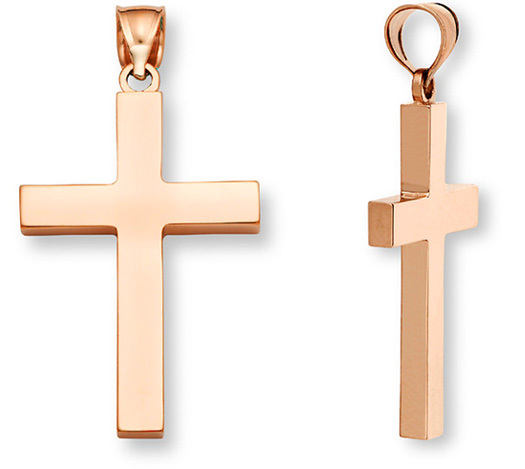 We guarantee our 14K Rose Gold Solid Cross Pendant for Women to be high quality, authentic jewelry, as described above.